At this point in my life, I have read about a dozen books on money management and investing. I have found most of them to be fairly interesting and have learned a lot from them. But unfortunately, the great majority of sane people would find them boring and tedious, they are. I say unfortunately not because I want everybody to be a finance nerd like me, but because I believe that having a solid understanding of money and its intricacies is one of the most powerful tools you can use to thrive and live a great life in this modern world we live in. I need to say unfortunately no more! About a year ago J.L. Collins published The Simple Path to Wealth. This book does an amazing job at presenting things in a simple and entertaining way while keeping a solid level of depth and insightfulness. Let’s start by talking a little bit about the author. Jim Collins is the go-to person in the Financial Independence (FI) community when it comes to investing in the stock market. Jim and his work are endorsed by all of my personal FI heroes. Mr. Collins’s motivation to create much of his amazing content comes from his daughter who, like most people, is not a personal finance junkie. In her own words to him: “Dad, I know this is important. I appreciate money. I know I need it. I just don’t want to have to think about it and manage it.”. As such, Jim Collins set out to package all of this amazing knowledge in a way that anybody could understand and benefit from. He succeeded. If you want to learn more about Jim Collins, I suggest you checkout this article “How I failed my daughter and a simple path to wealth.”, as well as his blog. When this book came out about a year ago, everybody in the FI community had great things to say about it, now I see why. I wanted to get my hands on it as soon as it came out but my local library did not have it, so I moved on to other books such as the Millionaire Next Door. Luckily for me, Jim Collins was interviewed on the Choose FI Podcast not long ago. From Mr. Collins himself, I learned that one can request a local library to order books that are not currently on stock. Armed with this knowledge, I went to my local library’s website and was able to request The Simple Path to Wealth through an interlibrary loan! Let’s pause for a second and appreciate two awesome things going on here. First, Jim Collins’s financial independence gives him the ability to freely tell us how to get his book without buying it. He does not depend on the sales of his book to pay the bills, his investments are taking care of that. As such, he was able to create this amazing content without a profit motive and he even tells people how to get a hold of it for free. The other cool thing is that you can basically get any book you want for free! I think books are worth spending money on, but why would you if you don’t have to? I have been a fan of my local library for a while, but had been slightly disappointed about the fact that I couldn’t find certain books. The interlibrary loans solve this problem! This book was born out of J.L. Collins’s Stock Series. As such, I thought nearly all of its content revolved around investing. However, I was happy to find this isn’t the case. I was pleasantly surprised to read about tax planning, debt, F-you money, the 4% withdrawal rate, and even a case study that brings much of this knowledge to life. 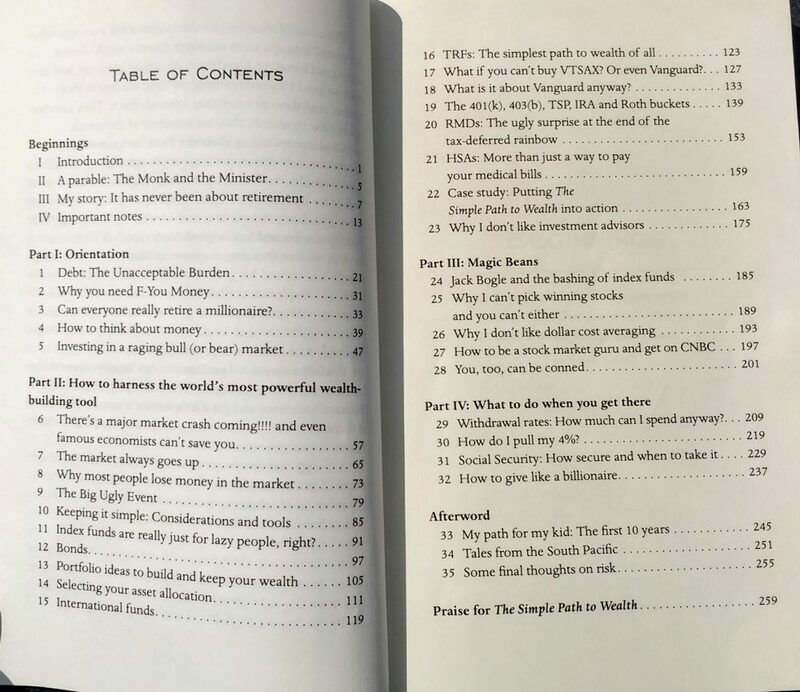 I recommend all of the books I write reviews about, but I must say The Simple Path to Wealth is at the very top of the list. It is a must read for anyone interested in financial independence. You can buy this book online for about $14 or try finding it for free at your local library ???? Oooh, I really like that it focuses so much on investments. That’s an area I definitely need to improve on, for sure. Thanks for the review! Thank you for stopping by! If you haven’t read it yet, you’ll be pleasantly surprised to learn how simple investing can be.